The invention relates to an oxidation dye composition for keratinic fibers, especially for human keratinic fibers such as hair, containing at least one oxidation dye and a thickening polymer with a plastic ether skeleton, in a medium which is suitable for dyeing. The invention also relates to the dyeing method and devices for using the inventive composition. The present invention relates to a composition for the oxidation dyeing of keratin fibers, and in particular of human keratin fibers such as the hair, comprising at least one oxidation dye and at least one thickening polymer with an aminoplast-ether skeleton. It is known practice to dye keratin fibers, and in particular human hair, with dye compositions containing oxidation dye precursors, generally known as “oxidation bases”, in particular ortho- or para-phenylenediamines, ortho- or para-aminophenols, and heterocyclic bases. Oxidation dye precursors are compounds that are initially uncolored or only weakly colored, which develop their dyeing power on the hair in the presence of oxidizing agents, leading to the formation of colored compounds. The formation of these colored compounds results either from an oxidative condensation of the “oxidation bases” with themselves, or from an oxidative condensation of the “oxidation bases” with coloration modifiers, or “couplers”, which are generally present in the dye compositions used in oxidation dyeing and are represented more particularly by meta-phenylenediamines, meta-aminophenols and meta-diphenols, and certain heterocyclic compounds. The variety of molecules used, which consist firstly of the “oxidation bases” and secondly of the “couplers”, makes it possible to obtain a very wide range of colors. To localize the oxidation dye product on application to the hair so that it does not run down the face or beyond the areas which it is proposed to dye, use has been made hitherto of conventional thickeners such as crosslinked polyacrylic acid, hydroxyethylcelluloses, certain polyurethanes, waxes or mixtures of nonionic surfactants with an HLB (Hydrophilic-Lipophilic Balance) value, which, when suitably chosen, give rise to the gelling effect when they are diluted with water and/or surfactants. However, the Applicant has found that the thickening systems mentioned above do not make it possible to obtain intense and chromatic shades of low selectivity and good staying power, while at the same time leaving the treated hair in a good cosmetic condition. Moreover, the Applicant has also found that ready-to-use dye compositions containing the oxidation dye(s) and the thickener systems of the prior art do not allow a sufficiently precise application without running or falls in viscosity over time. However, after considerable research conducted in this matter, the Applicant has now discovered that it is possible to obtain ready-to-use oxidation dye compositions that do not run and thus remain satisfactorily localized at the point of application, and that also make it possible to obtain powerful and chromatic (luminous) shades with low selectivity and good staying power with respect to chemical agents (shampoos, permanent-waving agents, etc.) or natural agents (light, perspiration, etc.) while at the same time giving the hair good cosmetic properties, if an effective amount of a polymer with an aminoplast-ether skeleton is introduced (i) either into the composition containing the oxidation dye(s) and optionally the coupler(s) [or composition A], or (ii) into the oxidizing composition [or composition B], or (iii) into both compositions at the same time. One subject of the present invention is thus a composition for the oxidation dyeing of keratin fibers, in particular of human keratin fibers such as the hair, comprising, in a medium that is suitable for dyeing, at least one oxidation dye, which is characterized in that it also contains at least one polymer with an aminoplast-ether skeleton. Another subject of the invention relates to a ready-to-use composition for dyeing keratin fibers, which contains at least one oxidation dye and at least one polymer with an aminoplast-ether skeleton and an oxidizing agent. For the purposes of the invention, the expression “ready-to-use composition” means any composition intended to be applied immediately to keratin fibers. The invention is also directed toward a process for dyeing keratin fibers, and in particular human keratin fibers such as the hair, which consists in applying to the fibers at least one composition A containing, in a medium that is suitable for dyeing, at least one oxidation dye, the color being developed at alkaline, neutral or acidic pH with the aid of a composition B containing at least one oxidizing agent that is mixed only at the time of use with composition A, or that is applied sequentially without intermediate rinsing, at least one polymer with an aminoplast-ether skeleton being present in composition A or in composition B or in each of the compositions A and B. A subject of the invention is also dyeing devices or multi-compartment “kits”. A two-compartment device according to the invention comprises a compartment that contains a composition Al containing, in a medium that is suitable for dyeing, at least one oxidation dye, and another compartment that contains a composition B1 containing, in a medium that is suitable for dyeing, an oxidizing agent, the polymer with an aminoplast-ether skeleton being present in the composition A1 or the composition B1, or in each of the compositions A1 and B1. Another device, containing 3 compartments according to the invention, comprises a first compartment that contains a composition A2 containing, in a medium that is suitable for dyeing, at least one oxidation dye, a second compartment that contains a composition B2 containing, in a medium that is suitable for dyeing, at least one oxidizing agent, and a third compartment that contains a composition C containing, in a medium that is suitable for dyeing, at least one polymer with an aminoplast-ether skeleton, composition A2 and/or composition B2 also possibly containing a polymer with an aminoplast-ether skeleton. However, other characteristics, aspects, subjects and advantages of the invention will emerge even more clearly on reading the description and the examples that follow. For the purposes of the present invention, the term “aminoplast-ether” means any product derived from the condensation of an aldehyde with an amine or an amide. For the purposes of the present invention, the term “aminoplast-ether” also means any structural unit formed from an aminoplast residue and a divalent hydrocarbon-based residue linked to the aminoplast residue via an ether bond. p denotes a positive integer, the group(s) OR being linked to the alkylene units of the AMP residue. q is a positive integer. AMP, R, R01, R02, p and q have the same meaning as above, R2 or R3, which may be identical or different, represent an end group that can denote a hydrogen atom, a group R01H, a group R02H, a group AMP(OR)p or any monofunctional group such as alkyl, cycloalkyl, aryl, aralkyl, alkylaryl, alkyloxyalkyl, aryloxyalkyl or cycloalkoxyalkyl, a being a number greater than 1 and preferably greater than 2.
x denotes 0 or 1.
in which R, p and x have the same meanings as above. Z4 denoting a hydrogen atom or a C1-C4 alkyl radical or a C1-C3 acyl radical, it being understood that at least one of the radicals Z4 of the radicals Z, Z′, Z2 and Z3 is other than acyl. Even more preferably, t=0 and Z, Z′ and Z3 denote —CH2CH2—, and at least one of the groups from among y and y′ is other than 0. The compounds of formula (XVII) are then polyethylene glycols. The aminoplast-ether polymers of formula (I) according to the invention are described in particular in U.S. Pat. No. 5,914,373, the content of which forms an integral part of the invention. 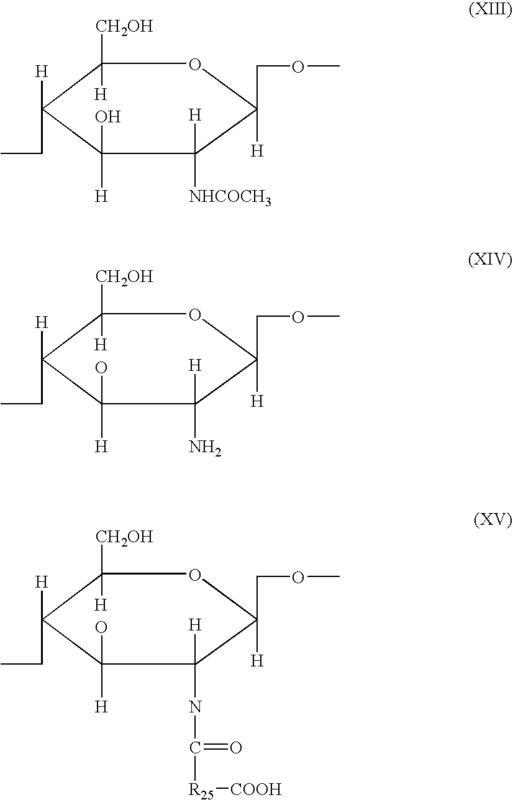 As polymers with an aminoplast-ether skeleton of formula (I), mention may be made in particular of the products Pure-Thix L [PEG-180/Octoxynol-40/TMMG Copolymer (INCI name)], Pure-Thix M [PEG-180/Laureth-50/TMMG Copolymer (INCI name)] and Pure-Thix HH [Polyether-1 (INCI name)] sold by the company Sud-Chemie. The polymers with an aminoplast-ether skeleton are preferably used in an amount that can range from about 0.01% to 10% by weight relative to the total weight of the ready-to-use dye composition. More preferably, this amount ranges from about 0.1% to 5% by weight. The oxidation dyes that may be used according to the invention are chosen from oxidation bases and/or couplers. Preferably, the compositions according to the invention contain at least one oxidation base. R4 represents a hydrogen atom, a halogen atom or a C1-C4 alkyl radical. Among the nitrogenous groups of formula (I) above that may especially be mentioned are amino, mono(C1-C4)alkylamino, di(C1-C4)alkylamino, tri(C1-C4)alkylamino, monohydroxy(C1-C4)alkylamino, imidazolinium and ammonium radicals. Among the para-phenylenediamines of formula (I) above which may be mentioned more particularly are para-phenylenediamine, para-tolylenediamine, 2-chloro-para-phenylenediamine, 2,3-dimethyl-para-phenylenediamine, 2,6-dimethyl-para-phenylenediamine, 2,6-diethyl-para-phenylenediamine, 2,5-dimethyl-para-phenylenediamine, N,N-dimethyl-para-phenylenediamine, N,N-diethyl-para-phenylenediamine, N,N-dipropyl-para-phenylenediamine, 4-amino-N,N-diethyl-3-methylaniline, N,N-bis(β-hydroxyethyl)-para-phenylenediamine, 4-amino-N,N-bis(β-hydroxyethyl)-3-methylaniline, 4-amino-3-chloro-N,N-bis(β-hydroxyethyl)aniline, 2β-hydroxyethyl-para-phenylenediamine, 2-fluoro-para-phenylenediamine, 2-isopropyl-para-phenylenediamine, N-(β-hydroxypropyl)-para-phenylenediamine, 2-hydroxy-methyl-para-phenylenediamine, N,N-dimethyl-3-methyl-para-phenylenediamine, N-ethyl-N-(β-hydroxyethyl)-para-phenylenediamine, N-(β,γ-dihydroxypropyl)-para-phenylenediamine, N-(4′-aminophenyl)-para-phenylenediamine, N-phenyl-para-phenylenediamine and 2-β-hydroxy-ethyloxy-para-phenylenediamine, and the addition salts thereof with an acid. Very particularly preferred among the para-phenylenediamines of formula (I) above are para-phenylenediamine, para-tolylenediamine, 2-isopropyl-para-phenylenediamine, 2-β-hydroxyethyl-para-phenyldiamine, 2-β-hydroxyethyloxy-para-phenylenediamine, 2,6-dimethyl-para-phenylene-diamine, 2,6-diethyl-para-phenylenediamine, 2,3-dimethyl-para-phenylenediamine, N,N-bis(β-hydroxyethyl)-para-phenylenediamine and 2-chloro-para-phenylenediamine, and the addition salts thereof with an acid. (II) According to the invention, the term “double bases” means compounds comprising at least two aromatic nuclei on which are borne amino and/or hydroxyl groups. 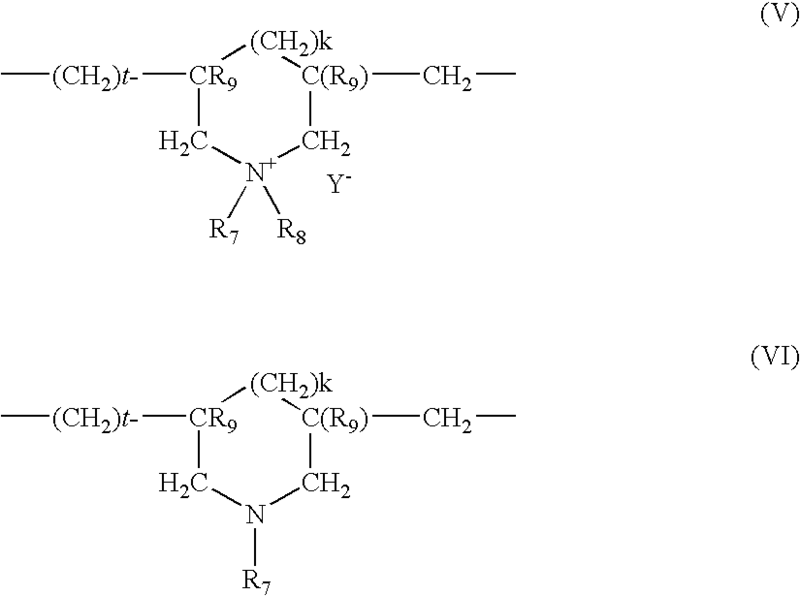 R7, R8, R9, R10, R11 and R12, which may be identical or different, represent a hydrogen atom, a linker arm Y or a C1-C4 alkyl radical; it being understood that the compounds of formula (II) contain only one linker arm Y per molecule. Among the nitrogenous groups of formula (II) above, mention may be made in particular of amino, mono(C1-C4)alkylamino, di(C1-C4)alkylamino, tri(C1-C4)alkylamino, monohydroxy(C1-C4)alkylamino, imidazolinium and ammonium radicals. Among the double bases of formula (II) above, mention may be made more particularly of N,N′-bis(β-hydroxyethyl)-N,N′-bis(4′-aminophenyl)-1,3-diaminopropanol, N,N′-bis(β-hydroxyethyl)-N,N′-bis(4′-amino-phenyl)ethylenediamine, N,N′-bis(4-aminophenyl)-tetramethylenediamine, N,N′-bis(β-hydroxyethyl)-N,N′-bis(4-aminophenyl)tetramethylenediamine, N,N′-bis(4-methylaminophenyl)tetramethylenediamine, N,N′-bis-(ethyl)-N,N′-bis(4′-amino-3′-methylphenyl)ethylenediamine and 1,8-bis(2,5-diaminophenoxy)-3,5-dioxaoctane, and the addition salts thereof with an acid. Among these double bases of formula (II), N,N′-bis(β-hydroxyethyl)-N,N′-bis(4′-aminophenyl)-1,3-diaminopropanol and 1,8-bis(2,5-diaminophenoxy)-3,5-dioxaoctane, or one of the addition salts thereof with an acid, are particularly preferred. R14 represents a hydrogen atom, a halogen atom, such as fluorine, or a C1-C4 alkyl, C1-C4 monohydroxyalkyl, C2-C4 polyhydroxyalkyl, Cl-C4 aminoalkyl, C1-C4 cyanoalkyl or (C1-C4)alkoxy (C1-C4)alkyl radical it being understood that at least one of the radicals R13 or R14 represents a hydrogen atom. (IV) The ortho-aminophenols which can be used as oxidation bases in the context of the present invention are chosen in particular from 2-aminophenol, 2-amino-1-hydroxy-5-methylbenzene, 2-amino-1-hydroxy-6-methylbenzene and 5-acetamido-2-aminophenol, and the addition salts thereof with an acid. (V) Among the heterocyclic bases which can be used as oxidation bases in the dye compositions in accordance with the invention, mention may be made more particularly of pyridine derivatives, pyrimidine derivatives and pyrazole derivatives, and the addition salts thereof with an acid. Among the pyridine derivatives, mention may be made more particularly of the compounds described, for example, in patents GB 1 026 978 and GB 1 153 196, such as 2,5-diaminopyridine, 2-(4-methoxyphenyl)amino-3-aminopyridine, 2,3-diamino-6-methoxypyridine, 2-(β-methoxyethyl)amino-3-amino-6-methoxypyridine and 3,4-diaminopyridine, and the addition salts thereof with an acid. Among the pyrimidine derivatives, mention may be made more particularly of the compounds described, for example, in German patent DE 2 359 399 or Japanese patents JP 88-169 571 and JP 91-10659 or patent application WO 96/15765, such as 2,4,5,6-tetraaminopyrimidine, 4-hydroxy-2,5,6-triaminopyrimidine, 2-hydroxy-4,5,6-triaminopyrimidine, 2,4-dihydroxy-5,6-diaminopyrimidine and 2,5,6-triaminopyrimidine, and pyrazolopyrimidine derivatives such as those mentioned in patent application FR-A-2 750 048 and among which mention may be made of pyrazolo[1,5-a]pyrimidine-3,7-diamine; 2,5-dimethylpyrazolo[1,5-a]pyrimidine-3,7-diamine; pyrazolo[1,5-a]pyrimidine-3,5-diamine; 2,7-dimethylpyrazolo[1,5-a]pyrimidine-3,5-diamine; 3-aminopyrazolo[1,5-a]pyrimidin-7-ol; 3-aminopyrazolo[1,5-a]pyrimidin-5-ol; 2-(3-aminopyrazolo[1,5-a]pyrimidin-7-ylamino)ethanol, 2-(7-aminopyrazolo[1,5-a]pyrimidin-3-ylamino)ethanol, 2-[(3-aminopyrazolo[1,5-a]pyrimidin-7-yl)(2-hydroxyethyl)amino]ethanol, 2-[(7-aminopyrazolo[1,5-a]pyrimidin-3-yl)(2-hydroxyethyl)amino]ethanol, 5,6-dimethylpyrazolo[1,5-a]pyrimidine-3,7-diamine, 2,6-dimethylpyrazolo[1,5-a]pyrimidine-3,7-diamine and 2,5,N7,N7-tetramethylpyrazolo[1,5-a]pyrimidine-3,7-diamine, and the addition salts thereof and the tautomeric forms thereof, when a tautomeric equilibrium exists, and the addition salts thereof with an acid. Among the pyrazole derivatives, mention may be made more particularly of the compounds described in patents DE 3 843 892, DE 4 133 957 and patent applications WO 94/08969, WO 94/08970, FR-A-2 733 749 and DE 195 43 988, such as 4,5-diamino-1-methylpyrazole, 4,5-diamino-1-hydroxyethylpyrazole, 3,4-diaminopyrazole, 4,5-diamano-1-(4′-chlorobenzyl)-pyrazole, 4,5-diamino-1,3-dimethylpyrazole, 4,5-diamino-3-methyl-1-phenylpyrazole, 4,5-diamino-1-methyl-3-phenylpyrazole, 4-amino-1,3-dimethyl-5-hydrazinopyrazole, 1-benzyl-4,5-diamino-3-methylpyrazole, 4,5-diamino-3-tert-butyl-1-methylpyrazole, 4,5-diamino-1-tert-butyl-3-methylpyrazole, 4,5-diamino-l-(β-hydroxyethyl)-3-methylpyrazole, 4,5-diamino-1-ethyl-3-methylpyrazole, 4,5-diamino-1-ethyl-3-(4′-methoxyphenyl)pyrazole, 4,5-diamino-1-ethyl-3-hydroxymethylpyrazole, 4,5-diamino-3-hydroxymethyl-1-methylpyrazole, 4,5-diamino-3-hydroxymethyl-1-isopropylpyrazole, 4,5-diamino-3-methyl-1-isopropylpyrazole, 4-amino-5-(2′-aminoethyl)amino-1,3-dimethylpyrazole, 3,4,5-triaminopyrazole, 1-methyl-3,4,5-triaminopyrazole, 3,5-diamino-1-methyl-4-methylaminopyrazole and 3,5-diamino-4-(β-hydroxyethyl)amino-1-methylpyrazole, and the addition salts thereof with an acid. According to the present invention, the oxidation bases preferably represent from 0.0005% to 12% by weight approximately relative to the total weight of the composition of composition A. The couplers which may be used in the dyeing process according to the invention are those conventionally used in oxidation dye compositions, that is to say meta-phenylenediamines, meta-aminophenols and meta-diphenols, mono- or polyhydroxylated naphthalene derivatives, sesamol and its derivatives, and heterocyclic compounds such as, for example, indole couplers, indoline couplers and pyridine couplers, and the addition salts thereof with an acid. These couplers can be chosen in particular from 2-methyl-5-aminophenol, 5-N-(β-hydroxyethyl)amino-2-methylphenol, 3-aminophenol, 1,3-dihydroxybenzene, 1,3-dihydroxy-2-methylbenzene, 4-chloro-1,3-dihydroxybenzene, 2,4-diamino-1-(β-hydroxyethyloxy)benzene, 2-amino-4-(β-hydroxyethylamino)-1-methoxybenzene, 1,3-diaminobenzene, 1,3-bis(2,4-diaminophenoxy)propane, sesamol, α-naphthol, 6-hydroxyindole, 4-hydroxyindole, 4-hydroxy-N-methylindole, 6-hydroxyindoline, 2,6-dihydroxy-4-methylpyridine, 1H-3-methylpyrazol-5-one and 1-phenyl-3-methylpyrazol-5-one, and the addition salts thereof with an acid. When they are present, these couplers preferably represent from 0.0001% to 10% by weight approximately relative to the total weight of the composition A, and even more preferably from 0.005% to 5% by weight approximately. In general, the addition salts with an acid of the oxidation bases and couplers are chosen in particular from the hydrochlorides, hydrobromides, sulfates, tartrates, lactates and acetates. In addition to the oxidation dyes defined above, the composition according to the invention may also contain direct dyes to enrich the shades with glints. In this case, these direct dyes may be chosen in particular from nitro, azo, anthraquinone, neutral, cationic or anionic dyes. More particularly, composition A and/or composition B can also contain at least one cationic or amphoteric substantive polymer. The cationic polymers that can be used in accordance with the present invention may be chosen from any of those already known per se as improving the cosmetic properties of the hair, i.e. in particular those described in patent application EP-A-337 354 and in French patents FR-2 270 846, 2 383 660, 2 598 611, 2 470 596 and 2 519 863. The preferred cationic polymers are chosen from those which contain units containing primary, secondary, tertiary and/or quaternary amine groups which can either form part of the main polymer chain or which can be carried by a lateral substituent that is directly attached thereto. The cationic polymers used generally have a number-average molecular mass of between 500 and 5×106 approximately, and preferably between 103 and 3×106 approximately. X denotes an anion derived from an inorganic or organic acid, such as a methosulfate anion or a halide such as chloride or bromide. Polymers of family (1) can also contain one or more units derived from comonomers which may be chosen from the family of acrylamides, methacrylamides, diacetone acrylamides, acrylamides and methacrylamides substituted on the nitrogen with lower (C1-C4) alkyls, acrylic or methacrylic acids or esters thereof, vinyllactams such as vinylpyrrolidone or vinylcaprolactam, and vinyl esters. quaternized vinylpyrrolidone/dimethylaminopropyl-methacrylamide copolymers such as the product sold under the name “Gafquat HS 100” by the company ISP. (2) The cellulose ether derivatives containing quaternary ammonium groups, described in French patent 1 492 597, and in particular polymers sold under the names “JR” (JR 400, JR 125 and JR 30M) or “LR” (LR 400, or LR 30M) by the company Union Carbide Corporation. These polymers are also defined in the CTFA dictionary as quaternary ammoniums of hydroxyethylcellulose that has reacted with an epoxide substituted with a trimethylammonium group. (3) Cationic cellulose derivatives such as cellulose copolymers or cellulose derivatives grafted with a water-soluble monomer of quaternary ammonium, and described in particular in U.S. Pat. No. 4,131,576, such as hydroxyalkylcelluloses, for instance hydroxymethyl-, hydroxyethyl- or hydroxypropylcelluloses grafted, in particular, with a methacryloylethyltrimethylammonium, methacrylamidopropyltrimethylammonium or dimethyldiallylammonium salt. The commercial products corresponding to this definition are more particularly the products sold under the names “Celquat L 200” and “Celquat H 100” by the company National Starch. (4) The cationic polysaccharides described more particularly in U.S. Pat. Nos. 3,589,578 and 4,031,307, such as guar gums containing cationic trialkylammonium groups. Guar gums modified with a salt (e.g. chloride) of 2,3-epoxypropyltrimethylammonium are used, for example. Such products are sold in particular under the trade names Jaguar C13 S, Jaguar C 15, Jaguar C 17 or Jaguar C162 by the company Meyhall. (5) Polymers consisting of piperazinyl units and of divalent alkylene or hydroxyalkylene radicals containing straight or branched chains, optionally interrupted by oxygen, sulfur or nitrogen atoms or by aromatic or heterocyclic rings, as well as the oxidation and/or quaternization products of these polymers. Such polymers are described, in particular, in French patents 2 162 025 and 2 280 361. (6) Water-soluble polyamino amides prepared in particular by polycondensation of an acidic compound with a polyamine; these polyamino amides can be crosslinked with an epihalohydrin, a diepoxide, a dianhydride, an unsaturated dianhydride, a bis-unsaturated derivative, a bis-halohydrin, a bis-azetidinium, a bis-haloacyldiamine, a bis-alkyl halide or alternatively with an oligomer resulting from the reaction of a difunctional compound which is reactive with a bis-halohydrin, a bis-azetidinium, a bis-haloacyldiamine, a bis-alkyl halide, an epihalohydrin, a diepoxide or a bis-unsaturated derivative; the crosslinking agent is used in proportions ranging from 0.025 to 0.35 mol per amine group of the polyamino amide; these polyamino amides can be alkylated or, if they contain one or more tertiary amine functions, they can be quaternized. Such polymers are described, in particular, in French patents 2 252 840 and 2 368 508. (7) The polyamino amide derivatives resulting from the condensation of polyalkylene polyamines with polycarboxylic acids followed by alkylation with difunctional agents. Mention may be made, for example, of adipic acid/dialkylaminohydroxyalkyldialkylenetriarmine polymers in which the alkyl radical contains from 1 to 4 carbon atoms and preferably denotes methyl, ethyl or propyl. Such polymers are described in particular in French patent 1 583 363. Among these derivatives, mention may be made more particularly of the adipic acid/dimethylaminohydroxypropyl/diethylenetriamine polymers sold under the name “Cartaretine F, F4 or F8” by the company Sandoz. (8) The polymers obtained by reaction of a polyalkylene polyamine containing two primary amine groups and at least one secondary amine group with a dicarboxylic acid chosen from diglycolic acid and saturated aliphatic dicarboxylic acids having from 3 to 8 carbon atoms. The molar ratio between the polyalkylene polyamine and the dicarboxylic acid is between 0.8:1 and 1.4:1; the polyamino amide resulting therefrom is reacted with epichlorohydrin in a molar ratio of epichlorohydrin relative to the secondary amine group of the polyamino amide of between 0.5:1 and 1.8:1. Such polymers are described in particular in U.S. Pat. Nos. 3,227,615 and 2,961,347. Polymers of this type are sold in particular under the name “Hercosett 57” by the company Hercules Inc. or alternatively under the name “PD 170” or “Delsette 101” by the company Hercules in the case of the adipic acid/epoxypropyl/diethylenetriamine copolymer. in which formulae k and t are equal to 0 or 1, the sum k+t being equal to 1; R9 denotes a hydrogen atom or a methyl radical; R7 and R8, independently of each other, denote an alkyl group having from 1 to 22 carbon atoms, a hydroxyalkyl group in which the alkyl group preferably has 1 to 5 carbon atoms, a lower C1-C4 amidoalkyl group, or R7 and R8 can denote, together with the nitrogen atom to which they are attached, heterocyclic groups such as piperidyl or morpholinyl; R7 and R8, independently of each other, preferably denote an alkyl group containing from 1 to 4 carbon atoms; Y−is an anion such as bromide, chloride, acetate, borate, citrate, tartrate, bisulfate, bisulfite, sulfate or phosphate. These polymers are described in particular in French patent 2 080 759 and in its Certificate of Addition 2 190 406. Among the polymers defined above, mention may be made more particularly of the dimethyldiallylammonium chloride homopolymer sold under the name “Merquat 100” by the company Calgon (and its homologues of low weight-average molecular mass) and copolymers of diallyldimethylammonium chloride and of acrylamide, sold under the name “Merquat 550”. These polymers generally have a number-average molecular mass of between 1000 and 100,000. Polymers of this type are described in particular in French patents 2 320 330, 2 270 846, 2 316 271, 2 336 434 and 2 413 907 and U.S. Pat. Nos. 2,273,780, 2,375,853, 2,388,614, 2,454,547, 3,206,462, 2,261,002, 2,271,378, 3,874,870, 4,001,432, 3,929,990, 3,966,904, 4,005,193, 4,025,617, 4,025,627, 4,025,653, 4,026,945 and 4,027,020.
in which R10, R11, R12 and R13, which may be identical or different, denote an alkyl or hydroxyalkyl radical containing from 1 to 4 carbon atoms approximately, n and p are integers ranging from 2 to 20 approximately, and X− is an anion derived from a mineral or organic acid. The cationic polymers comprising units of formula (IX) are disclosed in particular in patent application EP-A-122 324 and may be prepared according to the processes disclosed in U.S. Pat. Nos. 4,157,388, 4,390,689, 4,702,906 and 4,719,282.
d) a “block copolymer” formed from units corresponding to the polymers described in paragraphs a) and c), sold by the company Miranol under the names Mirapol-9 (C13 NMR molecular mass of about 7800), Mirapol-175 (C13 NMR molecular mass of about 8000) and Mirapol-95 (C13 NMR molecular mass of about 12 500). Even more particularly, the polymer which is preferred according to the invention is a polymer containing units of formula (IX) in which p is equal to 3, D denotes the value zero and X denotes a chlorine atom, the molecular mass, measured by carbon-13 NMR (C13 NMR), being about 25 500. (12) Quaternary polymers of vinylpyrrolidone and of vinylimidazole, such as, for example, the produces sold under the names Luviquat FC 905, FC 550 and FC 370 by the company BASF. (13) Polyamines such as Polyquart H sold by Henkel under the reference name “Polyethylene glycol (15) tallow polyamine” in the CTFA dictionary. (14) Crosslinked methacryloyloxy (C1-C4) alkyltri(C1-C4)alkylammonium salt polymers such as the polymers obtained by homopolymerization of dimethylaminoethyl methacrylate quaternized with methyl chloride, or by copolymerization of acrylamide with dimethylaminoethyl methacrylate quaternized with methyl chloride, the homo- or copolymerization being followed by crosslinking with a compound containing olefinic unsaturation, in particular methylenebisacrylamide. A crosslinked acrylamide/methacryloyloxyethyltrimethylammonium chloride copolymer (20/80 by weight) in the form of a dispersion containing 50% by weight of said copolymer in mineral oil can be used more particularly. This dispersion is sold under the name “Salcare® SC 92” by the company Allied Colloids. A crosslinked methacryloyloxyethyltrimethylammonium chloride homopolymer containing about 50% by weight of the homopolymer in mineral oil or in a liquid ester can also be used. These dispersions are sold under the names “Salcare® SC 95” and “Salcare® SC 96” by the company Allied Colloids. Other cationic polymers which can be used in the context of the invention are polyalkyleneimines, in particular polyethyleneimines, polymers containing vinylpyridine or vinylpyridinium units, condensates of polyamines and of epichlorohydrin, quaternary polyureylenes and chitin derivatives. and in particular those in which the molecular weight, determined by gel permeation chromatography, is about 1200. The concentration of cationic polymer in the compositions according to the present invention can range from 0.01% to 10% by weight relative to the total weight of the composition, preferably from 0.05% to 5% and even more preferably from 0.1% to 3%. K and M can also denote a cationic polymer chain containing primary, secondary, tertiary or quaternary amine groups, in which at least one of the amine groups bears a carboxylic or sultonic group connected via a hydrocarbon radical or alternatively K and M form part of a chain of a polymer containing an α,β-dicarboxylic ethylene unit in which one of the carboxylic groups has been made to react with a polyamine containing one or more primary or secondary amine groups. (1) Polymers resulting from the copolymerization of a monomer derived from a vinyl compound bearing a carboxylic group such as, more particularly, acrylic acid, methacrylic acid, maleic acid, α-chloroacrylic acid, and a basic monomer derived from a substituted vinyl compound containing at least one basic atom, such as, more particularly, dialkylaminoalkyl methacrylates and acrylates, dialkylaminoalkylmethacrylamides and -acrylamides. Such compounds are described in U.S. Pat. No. 3,836,537. Mention may also be made of the sodium acrylate/acrylamidopropyltrimethylammonium chloride copolymer sold under the name Polyquart KE 3033 by the company Henkel. The vinyl compound can also be a dialkyldiallylammonium salt such as dimethyldiallylammonium chloride. The copolymers of acrylic acid and of the latter monomer are sold under the names Merquat 280, Merquat 295 and Merquat Plus 3330 by the company Calgon. c) at least one basic comonomer such as esters containing primary, secondary, tertiary and quaternary amine substituents of acrylic and methacrylic acids and the product of quaternization of dimethylaminoethyl methacrylate with dimethyl or diethyl sulfate. The N-substituted acrylamides or methacrylamides which are more particularly preferred according to the invention are groups in which the alkyl radicals contain from 2 to 12 carbon atoms and more particularly N-ethylacrylamide, N-tert-butylacryl-amide, N-tert-octylacrylamide, N-octylacrylamide, N-decylacrylamide, N-dodecylacrylamide and the corresponding methacrylamides. The copolymers whose CTFA (4th edition, 1991) name is octylacrylamide/acrylates/butylaminoethyl methacrylate copolymer such as the products sold under the name Amphomer or Lovocryl 47 by the company National Starch are particularly used. c) in proportions of from 0 to 20 mol%, the —NH—(CH2)6—NH— radical derived from hexamethylenediamine, these polyamino amines being crosslinked by addition of a difunctional crosslinking agent chosen from epihalohydrins, diepoxides, dianhydrides and bis-unsaturated derivatives, using from 0.025 to 0.35 mol of crosslinking agent per amine group of the polyamino amide and alkylated by the action of acrylic acid, chloroacetic acid or an alkane sultone, or salts thereof. The saturated carboxylic acids are preferably chosen from acids having 6 to 10 carbon atoms, such as adipic acid, 2,2,4-trimethyladipic acid and 2,4,4-trimethyladipic acid, terephthalic acid, acids containing an ethylenic double bond such as, for example, acrylic acid, methacrylic acid and itaconic acid. in which R20 denotes a polymerizable unsaturated group such as an acrylate, methacrylate, acrylamide or methacrylamide group, y and z represent an integer from 1 to 3, R21 and R22 represent a hydrogen atom, methyl, ethyl or propyl, R23 and R24 represent a hydrogen atom or an alkyl radical such that the sum of the carbon atoms in R23 and R24 does not exceed 10. By way of example, mention may be made of the copolymer of methyl methacrylate/dimethylcarboxymethylammonio ethyl methacrylate such as the product sold under the name Diaformer Z301 by the company Sandoz. or, if q=1, R26, R27 and R28 each represent a hydrogen atom, as well as the salts formed by these compounds with bases or acids. as well as the higher homologues of these radicals and containing up to 6 carbon atoms. and X denotes the symbol E or E′ and at least once E′; E having the meaning given above and E′is a divalent radical which is an alkylene radical with a straight or branched chain having up to 7 carbon atoms in the main chain, which is unsubstituted or substituted with one or more hydroxy: radicals and containing one or more nitrogen atoms, the nitrogen atom being substituted with an alkyl chain which is optionally interrupted by an oxygen atom and necessarily containing one or more carboxyl functions or one or more hydroxyl functions and betainized by reaction with chloroacetic acid or sodium chloroacetate. (9) (C1-C5)alkyl vinyl ether/maleic anhydride copolymers partially modified by semiamidation with an N,N-dialkylaminoalkylamine such as N,N-dimethylaminopropylamine or by semiesterification with an N,N-dialkanolamine. These copolymers can also contain other vinyl comonomers such as vinylcaprolactam. The amphoteric polymers that are particularly preferred according to the invention are those of family (1). According to the invention, the amphoteric polymer(s) can represent from 0.01% to 10% by weight, preferably from 0.05% to 5% by weight and even more preferably from 0.1% to 3% by weight, relative to the total weight of the composition. The compositions of the invention preferably comprise one or more surfactants. The surfactant(s) can be chosen without preference, alone or as mixtures, from anionic, amphoteric, nonionic, zwitterionic and cationic surfactants. As examples of anionic surfactants which can be used, alone or as mixtures, in the context of the present invention, mention may be made in particular (nonlimiting list) of salts (in particular alkaline salts, especially sodium salts, ammonium salts, amine salts, amino alcohol salts or magnesium salts) of the following compounds: alkyl sulfates, alkyl ether sulfates, alkylamido ether sulfates, alkylarylpolyether sulfates, monoglyceride sulfates; alkyl sulfonates, alkyl phosphates, alkylamide sulfonates, alkylaryl sulfonates, α-olefin sulfonates, paraffin sulfonates; (C6-C24) alkyl sulfosuccinates, (C6-C24) alkyl ether sulfosuccinates, (C6-C24) alkylamide sulfosuccinates; (C6-C24) alkyl sulfoacetates; (C6-C24) acyl sarcosinates and (C6-C24) acyl glutamates. It is also possible to use the carboxylic esters of (C6-C24) alkylpolyglycosides, such as alkylglucoside citrates, alkypolyglycoside tartrates and alkylpolyglycoside sulfosuccinates, alkylsulfosuccinamates; acyl isethionates and N-acyltaurates, the alkyl or acyl radical of all of these various compounds preferably containing from 12 to 20 carbon atoms, and the aryl radical preferably denoting a phenyl or benzyl group. Among the anionic surfactants which can also be used, mention may also be made of fatty acid salts such as the salts of oleic, ricinoleic, palmitic and stearic acids, coconut oil acid or hydrogenated coconut oil acid; acyl lactylates in which the acyl radical contains 8 to 20 carbon atoms. Alkyl-D-galactosideuronic acids and their salts, polyoxyalkylenated (C6-C24) alkyl ether carboxylic acids, polyoxyalkylenated (C6-C24) alkylaryl ether carboxylic acids, polyoxyalkylenated (C6-C24) alkylamido ether carboxylic acids and their salts, in particular those containing from 2 to 50 alkylene oxide, in particular ethylene oxide, groups, and mixtures thereof can also be used. Anionic surfactants comprising a carboxylic group are particularly preferred. The nonionic surfactants are also compounds that are well known per se (see in particular in this respect “Handbook of Surfactants” by M. R. Porter, published by Blackie & Son (Glasgow and London), 1991, pp. 116-178) and, in the context of the present invention, their nature is not a critical feature. Thus, they can be chosen in particular from (non-limiting list) polyethoxylated or polypropoxylated fatty acids or alkylphenols, (α-diols or alcohols having a fatty chain containing, for example, 8 to 18 carbon atoms, it being possible for the number of ethylene oxide or propylene oxide groups to range in particular from 2 to 50. Mention may also be made of copolymers of ethylene oxide and of propylene oxide, condensates of ethylene oxide and of propylene oxide with fatty alcohols; polyethoxylated fatty amides preferably having from 2 to 30 mol of ethylene oxide, polyglycerolated fatty amides containing on average 1 to 5, and in particular 1.5 to 4, glycerol groups; polyethoxylated fatty amines preferably containing 2 to 30 mol of ethylene oxide; oxyethylenated fatty acid esters of sorbitan having from 2 to 30 mol of ethylene oxide; fatty acid esters of sucrose, fatty acid esters of polyethylene glycol, alkylpolyglycosides, N-alkylglucamine derivatives, amine oxides such as (C10-C14)alkylamine oxides or N-acylaminopropylmorpholine oxides. It will be noted that the alkylpolyglycosides constitute nonionic surfactants that are particularly suitable in the context of the present invention. The amphoteric or zwitterionic surfactants, whose nature is not a critical feature in the context of the present invention, can be, in particular (non-limiting list), aliphatic secondary or tertiary amine derivatives in which the aliphatic radical is a linear or branched chain containing 8 to 18 carbon atoms and containing at least one water-soluble anionic group (for example carboxylate, sulfonate, sulfate, phosphate or phosphonate); mention may also be made of (C8-C20)alkylbetaines, sulfobetaines, (C8-C20)alkylamido(C1-C6)alkylbetaines or (C8-C20)alkylamido(C1-C6)alkylsulfobetaines. R34′denotes an alkyl radical of an acid R37—COOH present in coconut oil or in hydrolyzed linseed oil, an alkyl radical, in particular a C7, C9, C11 or C13 alkyl radical, a C17 alkyl radical and its iso form, an unsaturated C17 radical. Among the cationic surfactants which may be mentioned in particular (nonlimiting list) are: primary, secondary or tertiary fatty amine salts, optionally polyoxyalkylenated; quaternary ammonium salts such as tetraalkylammonium, alkylamidoalkyltrialkylammonium, trialkylbenzylammonium, trialkylhydroxyalkylammonium or alkylpyridinium chlorides or bromides; imidazoline derivatives; or amine oxides of cationic nature. The amounts of surfactants present in the ready-to-use composition according to the invention can range from 0.01% to 40% and preferably from 0.1% to 30% relative to the total weight of the composition. The compositions according to the invention can also contain other agents for adjusting the rheology, such as cellulosic thickeners (hydroxyethylcellulose, hydroxypropylcellulose, carboxymethylcellulose, etc. ), guar gum and its derivatives (hydroxypropyl guar, etc. ), gums of microbial origin (xanthan gum, scleroglucan gum, etc. ), synthetic thickeners such as crosslinked acrylic acid or acrylamidopropanesulfonic acid homopolymers and ionic or nonionic associative polymers such as the polymers sold under the names Pemulen TR1 or TR2 by the company Goodrich, Salcare SC90 by the company Allied Colloids, Aculyn 22, 28, 33, 44 or 46 by the company Rohm & Haas, and Elfacos T210 and T212 by the company Akzo. These additional thickeners can represent from 0.01% to 10% by weight relative to the total weight of the composition. The medium of the composition that is suitable for dyeing is preferably an aqueous medium consisting of water and may advantageously contain cosmetically acceptable organic solvents including, more particularly, alcohols such as ethyl alcohol, isopropyl alcohol, benzyl alcohol and phenylethyl alcohol, or glycols or glycol ethers such as, for example, ethylene glycol monomethyl, monoethyl and monobutyl ethers, propylene glycol or its ethers such as, for example, propylene glycol monomethyl ether, butylene glycol, dipropylene glycol and diethylene glycol alkyl ethers such as, for example, diethylene glycol monoethyl ether or monobutyl ether, in concentrations of between about 0.5% and 20% and preferably between about 2% and 10% by weight relative to the total weight of the composition. Composition A may also contain an effective amount of other agents, which are previously known elsewhere for oxidation dyeing, such as various common adjuvants, for instance sequestering agents such as EDTA and etidronic acid, UV screening agents, waxes, volatile or nonvolatile, cyclic or linear or branched silicones, which are possibly organomodified (especially with amine groups), preserving agents, ceramides, pseudoceramides, plant, mineral or synthetic oils, vitamins or provitamins, for instance panthenol, opacifiers, etc. Said composition may also contain reducing agents or antioxidants. These may be chosen in particular from sodium sulfite, thioglycolic acid, thiolactic acid, sodium bisulfite, dehydroascorbic acid, hydroquinone, 2-methylhydroquinone, tert-butylhydroquinone and homogentisic acid, and they are then generally present in amounts ranging from about 0.05% to 1.5% by weight relative to the total weight of the composition. Needless to say, a person skilled in the art will take care to select the optional additional compound(s) mentioned above such that the advantageous properties intrinsically associated with the dye composition according to the invention are not, or are not substantially, adversely affected by the envisaged addition(s). In the ready-to-use composition or in the composition B, the oxidizing agent is preferably chosen from urea peroxide, alkali metal bromates or ferricyanides, and persalts such as perborates and persulfates. It is particularly preferred to use hydrogen peroxide. This oxidizing agent advantageously consists of an aqueous hydrogen peroxide solution whose titer may range, more particularly, from about 1 to 40 volumes and even more preferably from about 5 to 40 volumes. Oxidizing agents that may also be used are one or more redox enzymes such as laccases, peroxidases and 2-electron oxidoreductases (such as uricase), where appropriate in the presence of their respective donor or cofactor. The pH of the ready-to-use composition applied to the keratin fibers [composition resulting from the mixing of the dye composition A and of the oxidizing composition B] is generally between the values 4 and 11. It is preferably between 6 and 10, and may be adjusted to the desired value by means of acidifying or basifying agents that are well known in the prior art in the dyeing of keratin fibers. in which R is a propylene residue optionally substituted with a hydroxyl group or a C1-C4 alkyl radical; R38, R39, R40 and R41, which may be identical or different, represent a hydrogen atom, a C1-C4 alkyl radical or a C1-C4 hydroxyalkyl radical. The dyeing process according to the invention preferably consists in applying the ready-to-use composition prepared extemporaneously at the time of use from compositions A and B described above, to wet or dry keratin fibers, and leaving the composition to act for an exposure time preferably ranging from 1 to 60 minutes approximately, and more preferably from 10 to 45 minutes approximately, rinsing the fibers and then optionally washing them with shampoo, followed by rinsing them again and drying them. One variant of this process consists in taking a composition A′ comprising at least one oxidation dye but without polymer with an aminoplast-ether skeleton, and a composition A″ containing at least one polymer with an aminoplast-ether skeleton, and mixing together, at the time of use, these compositions A′and A″ with the composition B, and then applying the mixture and leaving it to act as previously. A concrete example illustrating the invention is given below, without, however, having any limiting nature. The mixture obtained was applied to locks of natural hair containing 90% white hairs, and was left on the locks for 30 minutes. The locks were then rinsed with water, washed with standard shampoo, rinsed again with water and then dried and disentangled. The hair was dyed in an intense purple-red shade. at least one thickening polymer with an aminoplast-ether skeleton. the OR groups are linked to the alkylene units of the AMP residue. a is an integer greater than 1. 7. The composition according to claim 6, wherein the monofunctional groups are chosen from at least one of alkyls, cycloalkyls, aryls, aralkyls, alkylaryls, alkyloxyalkyls, aryloxyalkyls and cycloalkoxyalkyl radicals. 8. The composition according to claim 6, wherein a is an integer greater than 2.
x is chosen from 0 and 1. 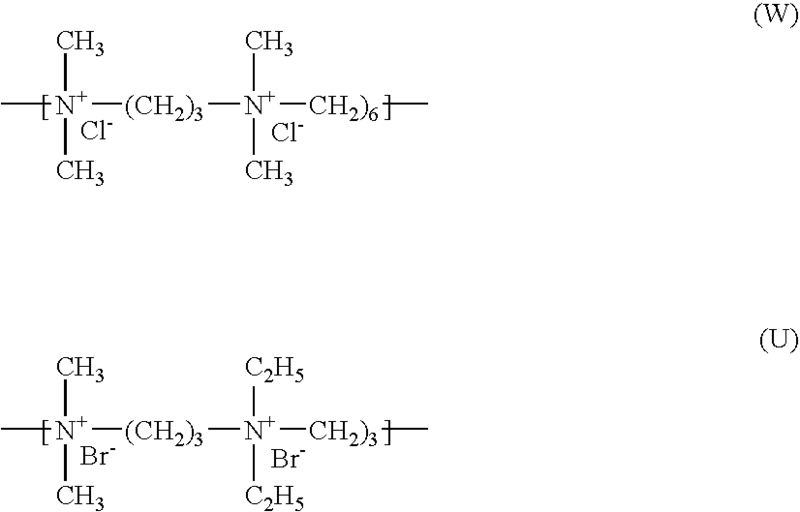 Z1 is chosen from linear, cyclic, branched, unbranched, aromatic, and nonaromatic radicals. 12. The composition according to claim 11, wherein the C2-C4 alkylene radicals are —CH2—CH(Z4)- and —CH2—CH(Z4)-CH2—; wherein Z4 is chosen from a hydrogen atom, C1-C4 alkyl radicals, and C1-C3 acyl radicals, wherein at least one of the Z4 radicals is not an acyl. 13. The composition according to claim 11, wherein the Z1 radical contains at least one hetero atom. 14. The composition according to claim 13, wherein the hetero atom is attached to 1 to 40 carbon atoms. 15. The composition according to claim 12, wherein the Z4 radical is chosen from a hydrogen atom and a methyl radical. 16. The composition according to claim 11, wherein t is 0 and Z, Z′ and Z3 are —CH2CH2—, and wherein at least one of y and y′ is not 0. 18. The composition according to claim 1, wherein said at least one thickening polymer with an aminoplast-ether skeleton is present in an amount ranging from about 0.01% to about 10% by weight with respect to the total weight of the composition. 19. The composition according to claim 1, wherein said at least one thickening polymer with an aminoplast-ether skeleton is present in an amount ranging from about 0.1% to about 5% by weight with respect to the total weight of the composition. 20. The composition according to claim 1, wherein the oxidation dye is chosen from oxidation bases and couplers. 21. The composition according to claim 20, wherein said composition comprises at least one oxidation base. 22. The composition according to claim 21, said at least one oxidation base is chosen from ortho-phenylenediamines, para-phenylenediamines, double bases, ortho-aminophenols, para-aminophenols, heterocyclic bases and the acid, addition salts thereof. R4 is chosen from a hydrogen atom, a halogen atom, and C1-C4 alkyl radicals. 24. 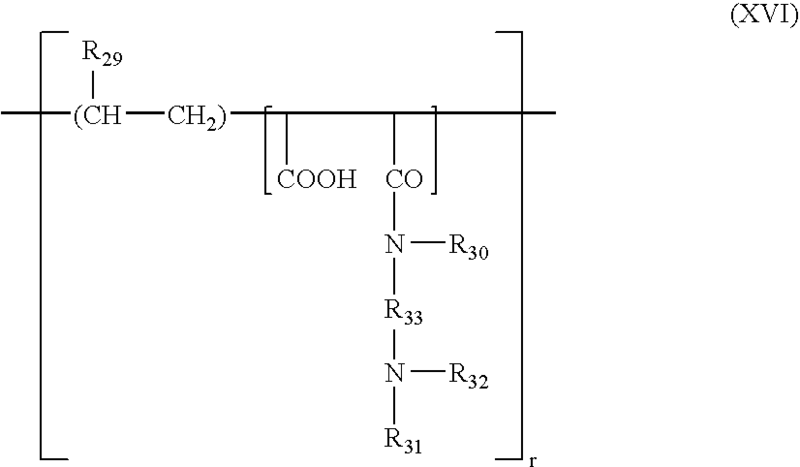 The composition according to claim 23, wherein R3 is a chlorine atom. wherein the compounds of formula (II) contain only one linker arm Y per molecule. 26. The composition according to claim 25, wherein the hetero atom is chosen from oxygen, sulphur, and nitrogen atoms. R14 is chosen from a hydrogen atom, a halogen atom, C1-C4 alkyl, C1-C4 monohydroxyalkyls, C2-C4 polyhydroxyalkyls, C1-C4 aminoalkyls, C1-C4 cyanoalkyls, and (C1-C4)alkoxy(C1-C4)alkyl radicals, wherein at least one of the radicals R13 and R14 is a hydrogen atom. 28. The composition according to claim 27, wherein R13 is fluorine. 29. The composition according to claim 27, wherein R14 is fluorine. 30. The composition according to claim 22, wherein the heterocyclic bases are chosen from at least one pyridine, pyrimidine, and pyrazole derivative. 31. The composition according to claim 30, wherein said pyrimidine derivatives are pyrazolopyrimidines. 32. The composition according to claim 20, wherein the oxidation bases are present in concentrations ranging from about 0.0005% to about 12% by weight with respect to the total weight of the composition. 33. The composition according to claim 20, wherein the couplers are chosen from at least one of meta-phenylenediamines, meta-aminophenols, meta-diphenols and heterocyclic couplers, and the acid addition salts thereof. 34. The composition according to claim 20, wherein said couplers are present in concentrations ranging from about 0.0001% to about 10% by weight with respect to the total weight of the composition. 35. The composition according to claim 22, wherein said acid addition salts of the oxidation dyes are chosen from at least one salt of hydrochlorides, hydrobromides, sulfates, tartrates, lactates, and acetates. 36. The composition according to claim 1, further comprising direct dyes. 37. The composition according to claim 1, wherein the composition further comprises at least one polymer chosen from cationic and amphoteric polymers. 40. The composition according to claim 37, wherein said at least one amphoteric polymer is a copolymer containing at least one acrylic acid monomer and a dimethyldiallylammonium salt. 41. The composition according to claim 37, wherein said at least one polymer is present in an amount ranging from about 0.01% to about 10% by weight with respect to the total weight of the composition. 42. The composition according to claim 37, wherein said at least one polymer is present in an amount ranging from about 0.05% to about 5% by weight with respect to the total weight of the composition. 43. The composition according to claim 37, wherein said at least one polymer is present in an amount ranging from about 0.1% to about 3% by weight with respect to the total weight of the composition. 44. The composition according to claim 1, further comprising at least one surfactant chosen from anionic, cationic, nonionic and amphoteric surfactants. 45. The composition according to claim 44, wherein said at least one surfactant is present in an amount ranging from about 0.01% to about 40% by weight with respect to the total weight of the composition. 46. The composition according to claim 44, wherein said at least one surfactant is present in an amount ranging from about 0.1% to about 30% by weight with respect to the total weight of the composition. 47. The composition according to claim 1, further comprising at least one additional thickener. 48. The composition according to claim 47, wherein said at least one additional thickener is chosen from cellulose derivatives, guar derivatives, gums of microbial origin, and synthetic thickeners. 49. The composition according to claim 47, wherein said at least one additional thickener is present in an amount ranging from about 0.01% to about 10% by weight with respect to the total weight of the composition. 50. The composition according to claim 1, further comprising at least one reducing agent in an amount ranging from about 0.05% to about 3% by weight with respect to the total weight of the composition. 52. The composition according to claim 51, wherein the oxidizing agent is chosen from at least one of hydrogen peroxide, urea peroxide, alkali metal bromates, alkali metal ferricyanides, persalts, and redox enzymes. 53. The composition according to claim 52, wherein the redox enzymes are present with their respective donor or cofactor. 54. The composition according to claim 52, wherein the oxidizing agent is hydrogen peroxide. 55. The composition according to claim 54, wherein the hydrogen peroxide is an aqueous hydrogen peroxide solution, the hydrogen peroxide content of which ranges from about 1 to about 40 volumes. 56. The composition according to claim 51, wherein the pH ranges from about 4 to about 11.
applying the mixture to the fibers. applying sequentially without intermediate rinsing a second composition comprising at least one oxidizing agent, wherein at least one polymer with an aminoplast-ether skeleton is present in at least one of said first composition and said second composition. 61. The process according to claim 57, wherein at least one of said first composition and said second composition further comprises at least one polymer chosen from cationic and amphoteric polymers and at least one surfactant. 62. The process according to claim 57, wherein at least one of said composition comprising at least one oxidation dye and said second composition further comprise at least one polymer chosen from cationic and amphoteric polymers and at least one surfactant. a second compartment containing a second composition comprising, in a cosmetically-acceptable medium, an oxidizing agent, at least one polymer with an aminoplast-ether skeleton present in at least one of said first and second compositions. a third compartment containing a third composition comprising, in a cosmetically-acceptable medium, at least one polymer with an aminoplast-ether skeleton, wherein at least one of said first and second compositions further comprises a polymer with an aminoplast-ether skeleton. 65. The process according to claim 58, wherein at least one of said first composition and said second composition further comprises at least one polymer chosen from cationic and amphoteric polymers and at least one surfactant. 66. The process according to claim 59, wherein at least one of said oxidation dye and said oxidizing composition further comprises at least one polymer chosen from cationic and amphoteric polymers and at least one surfactant. Co-pending Application-Title: Bleaching Composition for Keratinic Fibres, Containing a Thickening Polymer With an Ether Plastic Skeleton. Co-pending Application—Title: Bleaching Composition for Keratinic Fibres, Containing a Thickening Polymer With an Ether Plastic Skeleton. Co-pending Application-Title: Composition for Permanent Bleaching or Deformation of Keratin Fibers Comprising a Thickened Polymer With an Aminoplastic Ether Skeleton. Co-pending Application—Title: Composition for Permanent Bleaching or Deformation of Keratin Fibers Comprising a Thickened Polymer With an Aminoplastic Ether Skeleton. Co-pending Application-Title: Direct Dyeing Composition for Keratinic Fibres Containing a Thickening Polymer With an Ether Skeleton. Co-pending Application—Title: Direct Dyeing Composition for Keratinic Fibres Containing a Thickening Polymer With an Ether Skeleton. English language Derwent Abstract of FR 2 077 143, Oct. 15, 1971. English language Derwent Abstract of FR 2 080 759, Nov. 19, 1971. English language Derwent Abstract of FR 2 320 330, Mar. 4, 1977. English language Derwent Abstract of FR 2 336 434, Jul. 22, 1977. English language Derwent Abstract of JP 2-19576, Jan. 23, 1990. English language Derwent Abstract of JP 9-110659, Apr. 28, 1997. M.R. Porter, "Handbook of Surfactants," Blackie & Son, Ltd., Glasgow & London, 1991, pp. 116-178.